Toyota is developing an electric version of the iQ in-house. Toyota Motor Corp. will launch an electric version of its iQ minicar in 2012, targeting urban commuters who drive short distances. Toyota said the battery-powered iQ will be cheaper than rival electric cars such as the Mitsubishi i-MiEV or the Nissan Leaf. Both are larger than the 3+1-seat iQ. Toyota did not specify a price range for the planned electric car. 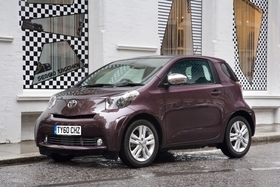 Prices for the iQ with a gasoline engine start at 12,900 euros (about $17,640) in Germany. The battery powered iQ will run 105km (65 miles) on a single charge. It will launch in Europe, Japan and the United States. Sales in China are also being considered, the company said. Toyota is developing the iQ in-house and is also working with luxury electric car maker Tesla Motors Inc. on an electric version of its RAV4 compact SUV. At the Los Angeles auto show this week, a battery-powered RAV4 concept was unveiled that's planned for sale in the United States in 2012. The car has a range of 100 miles (162km) on a single charge. A Prius-based plug-in hybrid will also launch by early 2012 in Japan, the United States and Europe, with targeted sales of more than 50,000 units a year, priced at 3 million yen ($36,000) in Japan. The car can be plugged in to an electricity source to enable longer-distance driving using only electricity. Toyota is also developing a sedan-type fuel-cell hybrid vehicle, with sales aimed to start in 2015 in Japan, the United States and Europe. The company said it is researching development of next-generation batteries with better performance than lithium-ion batteries currently used in electric cars. "Such research is aimed to help bring about the revolutionary advances in battery performance that will be necessary for the broad adoption of electric-motor-propelled eco-cars," Toyota said in a statement.